This June on a perfect summers day we welcomed all to our Open Evening, this was a great chance to see the space set up and also celebrate H-Coo Events 4th Birthday. The Evening included a spectacular festival style set up including Stretch Tent Marquee, Body Art & Fire Performance, Glamping Bell Tents, Wonderful Flowers Props & Venue Styling & Open Bar raising money with generous donations for Cancer Research Uk . Working with talented like minded local suppliers is the one of the best things; we were very lucky to work with an amazing selected bunch of talent offering services that compliment what we do at our venue The Grange & with our planning and styling services. Perfect for Glamping accommodation, chill out or Kiddie area. Bell Tent Villages are a great way to put up a number of guests for a festival wedding. Although we don’t have a license for getting married at The Grange you are welcome to have an outdoor blessing between two old apple trees (This does mean doing the legal bit before or after your wedding). Anyone can perform your ceremony, however we do know of some excellent Celebrants that can help and support you and perform your ceremony. The bonus is the freedom allows you to have a ceremony that reflects your personalities, celebrating you as a couple in your own chosen way. Talented Body Artist Amanda Cooper from The Painted Peach added an extra special element with Body Art & Fire Performance. It was also great to see the showcase of Bridal Painting & Bride Model which is something that I think we will come to see more and more of for festival weddings. See it here first with Painted Peach. Models can be painted for any purpose imaginable how about a Stag Waiter serving drinks on your day? 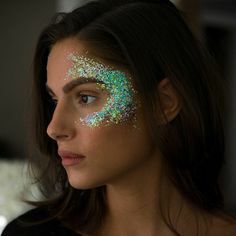 Face painting is also offered as a way to give your event and guests extra sparkle. Bouquet & Top Table Arrangement from Bristol based Belle De Jour was just perfect and complimented our nature unique approach to the event styling. I can’t recommend the Stretch Tent enough as one of our Marquee options it really was beautiful inside and perfect for a festival style wedding or if you fancy something a bit different. The comments it got were all very positive. A glass of Thatcher’s Family Reserve was the cherry on Top of the evening, or if you’re more of a beer drinker then Twisted Oak Beer would have up your street! For the soft drinks Bradley’s Juice which is made just down the road offer a range of delicious Juices. Nibbles; Olives, Beetroot Humous & Cheese Cake were on offer for the peckish. All in all it really was a fantastic evening, it was a buzzy blur with couples and families enjoying the evening toped off with a fire pit to end the night. I’m delighted to share these beautiful photos of Anna & Tom’s Wedding, who had their reception here at The Grange earlier this summer, after a local Church Wedding. It was a stunning day with rustic and romantic details. The day started with the bridal party having breakfast and getting ready in our B&B room. The couple had everything as they wished with personal touches running through the day. The skittle alley and garden games were very popular, a lot of thought was put into the details including the food, which made the day very relaxed. Our pet lambs get involved as Anna & Tom take a few moments to themselves for private photographs on arrival of their reception at The Grange. ‘Semi-Toned’ an all male A Cappella group perform after the meal which adds a lovely personal touch with Brother of the Bride being a member of the group. Photography by Paul Blakemore. Ceremony, Once. If getting married in a church or registry office doesn’t fit in with your wedding dreams, then you may find the benefits of a blessing are endless. A blessing means that you can have a ceremony that is very personal and unique to you. There are no limitations of sticking to tradition or fixed vows. You don’t have to worry about laws or sticking to licensed areas or staying under a roof. Between two old trees in the Cider Orchard is a lovely spot for ceremonies. There isn’t a wedding license at The Grange but you are welcome to have a blessing. With current laws there is still the need to do the legal bit before or after your wedding day. A key benefit to having a blessing is who performs the ceremony is your choice and this could be a family member or friend, a Humanist or Independent Celebrant. I had the pleasure of meeting Bec Gee who is co-founder of Once a few years ago through a friend. Once – arts & ceremonies are a company of independent celebrants. Once work on lots of creative projects as well as ceremonies and what struck me when I first came across them is their ability to celebrate something as simple as a local park or the changing of the seasons in a fun and meaningful way that involves the audience and in the process creating memorable experiences. 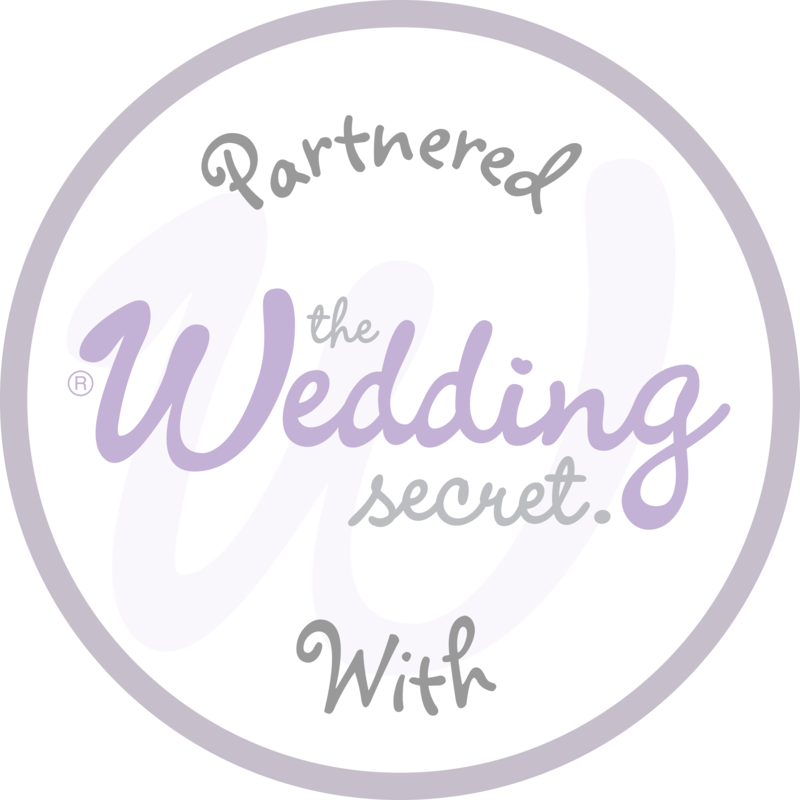 With their attention to detail and care, the beauty of working with Once for your wedding is they can offer something different, you know you will be looked after, leaving any worries behind you have about the process of a blessing. With years of experience they work with clients in the months leading up to a ceremony to write a script and craft the right activities to involve family and friends. “All our guests are saying things like …”this is the best wedding I’ve ever been to”…”why aren’t all weddings like this?”… “it was so you two, every part of it”…” There’s no doubt in our minds that this was because of the work we did with you on the ceremony and the day, keeping us and our love at the core of everything. Thank you. We’re loving married life, I know people often say it doesn’t feel any different but I think it really does. I put it down to our sessions with you in the run up as I think it helps highlight that it’s a very real transition. We wanted to let you now how much we loved and appreciated the wonderful ceremony you conducted for Adam and Emma last Saturday! It was quite a magical experience for us, and must have had a profound impact on many of the people present. We can’t think of a better springboard for a long and happy married life for them… You conducted the ceremony itself with such grace and joy, and in a way that blended perfectly with the happy and “fun” approach that we know that Adam and Emma wanted. Once offer an initial free consultation with couples to find out about their work and see how you might work together. To find out more contact Bec at info.once@gmail.com or call them on 07969 746720. It’s a pleasure to share the amazing images! of Liz & Patrick’s wedding that took place this June in the Cider Orchard at The Grange. There were lots of lovely personal touches from the bride, little dutch details and traditions were part of the planning in honour of the Groom and their time living together there. It was a stunning day with a laid back feel and inspired choices like- Split Screen Ice Creme Canapes, colourful festival style bunting made from left over hot air ballon material, bride and groom pegs lovingly made by the mother of the bride, flip flops for tired feet and much more. The reception started with the arrival of the bride and groom in a VW camper van and the guests welcomed by Pimms and lemonade. H-Coo’s bar Unit made from reclaimed wood and back bar ladder Props were used to great effect alongside BAR light up letters. H-Coo’s Bunting added a dash of colour. A great spot to explore with the bridal party for rustic backdrops, stunning photograph from Eleanor of Interlace photography. Credits; Venue-H-Coo Events @ The Grange/ Photograpy-Interlace Photography./ Props- H-Coo Events/ Light Up Letters-Lighthaus Events/ Cake-Mummy’s Little Cakery/ Flowers-Ivory Flowers./ Ice Cream-Split Screen Ice Cream. It’s lovely to share Simon & Sharon’s very elegant wedding that I styled and did all the flowers for this May. It was rewarding to be a part of my Uncles wedding and offer some personal touches to the day as a Stylist. Styling inspriration came from the Brides love of Ivory Calla lilies and their simple form teamed with the love and attachment for the venue location, a stones throw from Sand Bay beach in kewstoke. Bringing the outside in, soft drift-wood combined with other more structural flowers and foilage such as Protea, Sliver Brunia & Eucalyptus complimented the Calla Liles. A Driftwood arch acted as the ceremony backdrop decorated with foliage and flowers making a unique focal ponit for the ceremony. The Bride looked stunning in her simple yet elegant dress with pearl edge detailing. The Brides Bouquet with Large Calla Liles was simple and very effective. Daughter & Bridesmaid Georgie had a smaller bouquet. Styling details included a seating plan made from vintage postcards. Every child had a brimming goodie bag to keep them occuipied including bubbles that went down well, these were put together by the Bride. Mother of the Bride enjoying the Bouquet (Above). Lovely Mother/Daughter moment captured (Below). There were quite a few buttons holes to do for all the men including the Groom and four increasingly grown up Sons. It was touching to see them all together two of which had flown in from Australia & New Zealand. Credits; Flowers & Styling – H-Coo Events / Photography- Deja Vu Digital / Venue- Commodore Hotel, Sand Bay. We feel very lucky to have a brewery just down the road from The Grange, and not just any, one producing award winning beer! As it happens I’m not really much of a beer drinker myself but my family are and they highly rate RCH for their delicious beers, love the stuff. I don’t remember a family party or gathering without it making an appearance. RCH started in the early 1980’s and has been run by the Davey family since 1984. Along side their brewer Graham Dunbavan they have developed various excitingly tasty beers. Brothers Paul & Mark work together at the site in Hewish, their business has grown and expanded other the years you may have seen their beers shelved at local pubs & supermarkets such as; Sainsburys. In Hewish RCH supply The Full Quart you can also sample their beer in Wetherspoons pubs, they are also involved in beer festivals. The beers have won numerous awards at various CAMRA beer festivals as well as the Tuckers Malting’s Beer Festival. Graham has been brewing at RCH for 22 years, his passion for the beer making process was clear as he talked me through the various stages and ingredients that are used. To my pleasant surprise they mainly use Barley not Wheat, good news for a wheat intolerant! The different grades of barley are oven baked giving them a nutty taste; The Pale, Black, Chocolate & Crystal give the ales different tastes of bitterness and depth of colour. The Hops (they use real hops not pellets) also add to the level of bitterness and are used at the beginning and end of the process. Looking at all the equipment used such as the Mash Tun, Copper & Fermentation tanks there is obviously a science behind the process but by using the ingredients in different measure there is a more creative side. The live yeast has the all important job of adding the alcohol to the brew by fermentation. The whole process from start to finish takes approximately a week before it is ready to be bottled or put into kegs. Metal barrel kegs are used opposed to wood for hygiene and safety reasons. There are different type of hops that are used such as; Fuggles, Pilgram, Admiral, Boadicea, Progress, Goldings & Bramline Cross. Nothing goes to waste the left over barley mash is enjoyed by the neighbours cattle. Hewish IPA ABV 3.6%; A lightly, hopped bitter with a subtle sweetness and fruitful taste. Floral, citrus hop aroma all of which lasts well to the finish. A light brown colour. P.G. Steam ABV 3.9%;This complex multi layered ale has a floral hop aroma with medium bodied hop, bitter taste with some fruit and sweetness. East Street Cream ABV 5.0%; First brewed to celebrate the 500th guest beer at the Dartmouth Inn, Newton Abbot, and was named by a customer in a competition. It went down so well that it has become a regular beer. This enigmatic full bodied beer with malty hoppy fruit bitter with a sweet taste which all vie for dominance in this complex and well crafted premium chestnut coloured ale. Pitchfork ABV 4.3%; The name comes from the Pitchfork rebellion of 1685 the last battle to be fought on English soil of the Civil War. A golden bitter with floral citric hop aroma. It has a hoppy predominate taste which is slightly sweet and fruity and leaves you wanting more. Old Slug Porter ABV 4.5%; As the beer leaves a trail down the glass as you drink it like a slug, that’s how the beer was named.A delicious traditional porter with a full bodied taste of chocolate, coffee, blackcurrant and black cherry with a good aroma. A near black colour with a good white head when served through a tight sparkler. Firebox ABV 6.0%; Being rail enthusiasts the beer is named after the firebox in a steam engine. A reddish deep brown coloured beer which is a deceptively drinkable strong bitter with a fine combination of citrus hops and cherry fruit bittersweet flavours which gives a strong dry bitter finish. Double Header ABV 5.3%; Again a railway themed name after the name for two engines pulling a train. A golden brew made only with pale ale malt and Goldings hops giving it a well balanced hoppy flavour. They also brew special beers. A couple barrels of beer are a perfect feature for any wedding bar we stock RCH for our onsite bar, for DIY bars we can get some for you & your guests to enjoy! All this talk of beer is making me thirsty. Christmas is defiantly in the air! H-Coo has a special festive offer of £40 off styling services for bookings made by the 31/01/15. H-Coo Events offers styling & planning for your event or wedding. We can make your venue or marquee look extra special. This includes a personal service that is tailor made for you. You may already have some ideas and starting points but just need someone to help bring them together for you. Or you may just want help setting up on the day. We have a growing number of props and can source or make decor & details for the day, for example; signs, garlands, bunting, hay bales the list goes on..Our styling can help with, ambience, dressing the venue/s, creating chill out areas, sourcing or hiring props, table centre pieces, flowers, lighting, setting up. I have a particular love of romantic rustic, festival and vintage country style weddings. It’s an honour to be a small part of a couples day & love assisting with making the day truly memorable & special, with quirky details and personal touches. With a background in art & design and experience in events; I offer a creative outlook and fresh approach to weddings. No fuss, frills or chair covers in sight, opting for a more unique rooted approach with a rustic wholesome influence. Being a farmers daughter and living in the country has undoubtedly inspired me along the way. H-Coo puts you first in creating a style that reflects your likes and personalities. 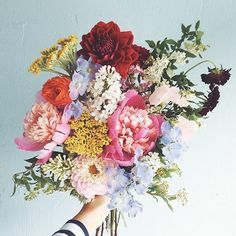 So whether you would like a sophisticated vintage, boho chic, country classic, festival style, bold & beautiful or magical woodland style wedding we work with you and are able to put together a digital inspiration board for you to get us started in the right direction. H-Coo Events have a genuine passion for events & celebrations and people’s positive experiences. We also believe that weddings can be beautiful and unique without, necessarily, costing the earth. We understand each couple and wedding is unique. We work to a range of budgets, tailor making a service to fit to your needs. We can be as hands on or off as you like, offering a service flexible to your needs. Get in touch for more information, I look forward to hearing from you! On a glorious September weekend this summer there was a beautiful wedding at The Grange! Matt & Mel’s Vintage/Festival Wedding. With an outdoor blessing there is an element of tension and finger crossing willing the weather to behave. Once the morning clouds had dispersed it was blissfully warm. 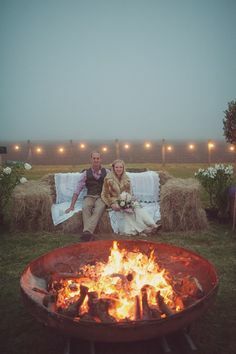 The majority of the planning & details came from the couple and there were some lovely unique touches and activities for guests to enjoy. The couple embraced the space in the Orchard and with guests camping over there was a lovely relaxed vibe to the day. From fire jugglers to the vintage pig bar there was a lot of thought and planning put into the day, the reward was everything ran smoothly. The couple celebrated their marriage in style with family and friends. The stunning images are captured by Noel Deasington Photography. Credits; Venue- H-Coo Events @ The Grange/ Noel Deasington Photography/ Bar-Cider Pig/ Flowers & Decor-Brides own.